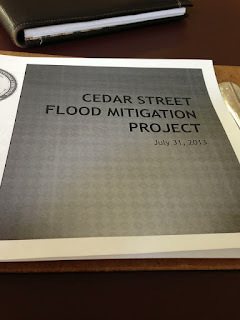 Somerville residents gathered on July 31st for an informational meeting on the Cedar Street Flood Mitigation project, tentatively, set for a summer 2014 begin date. This project is needed to update drainage systems that were installed in the early 1900s and alleviate capacity and structural issues. Melissa Miguel of the City’s Engineering Department offered a comprehensive presentation detailing the reason for the project and how it will impact residents. This presentation has been posted to the City’s Engineering page, as well as, its Construction page under Roads and Bridges. At this time, the RFP bid deadline has passed and design firms will be interviewed, researched, and graded before a final recommendation is made to the Mayor. Per the RFP, the design firm will be mandated to host 3-5 public meetings during different phases of the process which will, most likely, be in sections of 25%, 50%, 75% and 100% of the design process. It is these meetings that are the most critical and residents around the Cedar and Hall Street areas should attend. I read in the Somerville News that there will be flyering for the next meeting that comes up. I want to thank you in advance for doing this! I would have attended if I knew about the meeting.